If you're after a casual yet stylish outfit, consider pairing a Dolce & Gabbana Vintage elongated blazer with burgundy print jeans. Both garments are totally comfy and will look fabulous together. Choose a pair of beige leather ballerina shoes to make the ensemble more current. 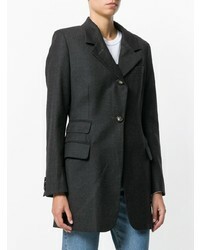 If you're searching for a casual yet totally chic look, consider teaming a charcoal blazer with charcoal dress pants. Both items are totally comfy and will look fabulous together. A pair of white canvas low top sneakers will be a welcome addition to your outfit. 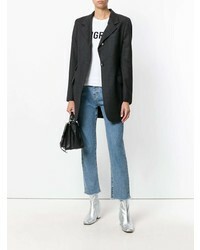 If you're in search of a casual yet chic outfit, go for a Dolce & Gabbana Vintage elongated blazer and blue jeans. Both garments are totally comfy and will look fabulous together. Polish off the ensemble with grey cutout leather ankle boots. 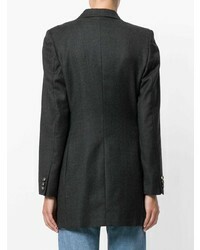 If you're hunting for a casual yet chic outfit, team a Dolce & Gabbana Vintage elongated blazer with white dress pants. Both items are totally comfy and will look fabulous paired together. Rock a pair of white leather flat sandals to have some fun with things. If you're after a casual yet absolutely chic ensemble, pair a Dolce & Gabbana Vintage elongated blazer with black leather skinny pants. Both pieces are totally comfy and will look fabulous paired together. A pair of black print high top sneakers brings the dressed-down touch to the outfit. If you're scouting for a casual yet stylish look, pair a Dolce & Gabbana Vintage elongated blazer with grey check tapered pants. Both garments are totally comfy and will look fabulous paired together. Make white canvas high top sneakers your footwear choice to make the outfit more current. If you're all about being comfortable when it comes to dressing up, this combination of a charcoal blazer and black leggings is just for you. Rocking a pair of black suede over the knee boots is an easy way to add some flair to your outfit. If you're obsessed with comfort dressing when it comes to fashion, you'll love this stylish combination of a Dolce & Gabbana Vintage elongated blazer and light blue ripped boyfriend jeans. Bump up the cool of your getup by rounding it off with tan leopard suede loafers. 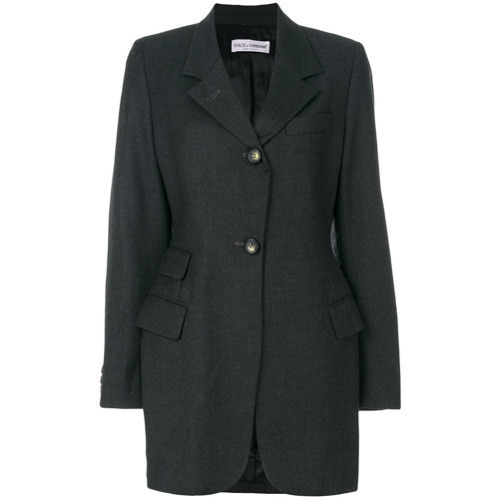 If you're after a casual yet stylish getup, consider pairing a charcoal blazer with a grey full skirt. Both pieces are totally comfy and will look fabulous paired together. Spruce up your getup with grey leather pumps.